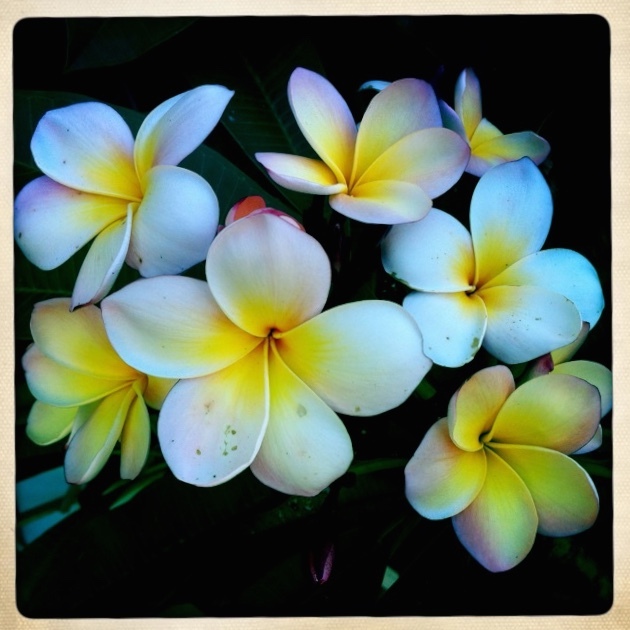 Frangipani is my all-time favourite flower. I fell in love the moment I saw it during my first visit to Australia. I adore its delicate simplicity, the freshness of its white petals flushed with yellow, and its sweet scent. Fangipani season was one of my most favourite times of year when I lived in Sydney. I was so excited to see the buds on its gnarly branches starting to blossom around December time, heralding the beginning of summer. I was always in awe to see a tree in full bloom, and to witness my neighbourhood streets carpeted with freshen fallen blooms was such a treat. On my walks, I used to collect a fistful to float in bowls of water at home and on my desk at work. And I couldn’t resist popping one of two of them in my hair. Recently, I was delighted to find a frangipani hair clip on eBay. I’ve been wearing it in my hair since it arrived, not really caring that I’m only wearing it around the house. It never fails to make me smile when I catch a glimpse of it in the mirror: my happy flower. So with this in mind, my happy for today is being grateful for my new frangipani hair clip. Beautiful frangipani I love that you have found a hair clip to remind you of it.